Clarissa, the wife of a Foreign Office diplomat, is given to daydreaming. 'Supposing I were to come down one morning and find a dead body in the library, what should I do?' she muses. Clarissa has her chance to find out when she discovers a body in the drawing-room of her house in Kent. 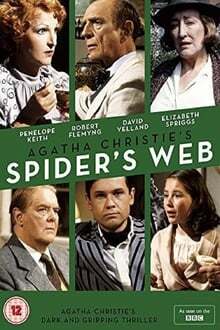 We don't have any reviews for Spider's Web. We don't have enough data to suggest any movies based on Spider's Web. You can help by rating movies you've seen.